２０１１年８月４－８日、沖縄国際大学と沖縄キリスト教学院大学で開催された国際会議ＤＵＯ Dialogue Under Occupation　の特別講義、吉田健正氏による故チャルマーズ・ジョンソン追悼講演の要旨とパワーポイントを紹介します。Yoshida Kensei, Okinawan jouranlist and author of Democracy Betrayed and numerous other books, gave a special lecture in memory of late Chalmers Johnson at the DUO (Dialogue Under Occupation) Conference, held at Okinawa International University and Okinawa Christian Unviersity from August 4 - 8. チャルマーズジョンソン氏についてのこのブログの過去の記事もご覧ください。See past posts about Chalmers Johnson below (in English and Japanese). 吉田氏のパワーポイントへのリンクはこちらです。Click below line for Yoshida's PowerPoint presentation (in Japanese). How should the United States be regarded in terms of world political history, and in terms of American political history? And what role does Okinawa play in this? Professor Chalmers Johnson, who passed away at 79 years old last November, was perhaps the only researcher that examined these three issues together. Professor Johnson called himself a Cold War warrior. Viewing China and the former Soviet Union as enemies, he worked as a consultant under Allen Dulles, one of the earliest directors of the CIA. Johnson helped assessing the strengths of Vietnam and China and was critical of the anti-war movement during the Vietnam War. However, the collapse of the Soviet Union, which pleased him, caused him to look skeptically at the US, and led to a major change in his thinking. Johnson noticed that although the United States had become the world’s greatest military power, the country had begun to follow the path of an empire, in the tradition of the British and Roman Empires. The republic that was initially founded on the principle of popular sovereignty (i.e. democracy) in opposition to monarchy was now building military bases throughout the world and transforming itself into an “empire of bases.” After World War II and the Cold War, the powers of the President were greatly expanded, and the country increasingly became resented for its overseas espionage, overturning of foreign governments, support of dictatorships, and endless waging of war. The extensive network of bases also led to the obstruction of democracy and economic development at home. In other words, the US was repeating the history of the British and Roman Empires. Johnson was concerned that without a change of course, the US would find itself increasingly more isolated internationally, would face internal contradictions, and would eventually collapse. Johnson focused his attention on Okinawa, as an example of the “empire of bases.” This poor and cramped prefecture hosts seventy-five percent of the US military bases in Japan. Not only has the US military been granted exclusive use rights for the bases, but also has been provided by the Japanese government with a “sympathy” budget that has made possible for base personnel and their families a lifestyle that includes shopping malls and golf courses. There have been numerous rapes and traffic accidents, but base personnel also enjoy the extraterritorial rights and protection provided by the Japan-US Status of Forces Agreement (SOFA). The 1995 case in which three US soldiers raped a young girl triggered anti-US and anti-base protests that were so intense that even the Japan-US relationship was threatened. This case and the ensuing protests, along with the US empire of military bases that appeared after the fall of the Soviet Union, opened the eyes of the Cold War warrior Johnson and turned him into the anti-imperialist researcher of regional studies (on Japan, China, and East Asia) at the University of California. Between 2000 and 2007, Johnson wrote a trilogy of books analyzing US imperialism’s current situation and future (arrogance and its consequences), edited Okinawa: Cold War Island, and contributed numerous articles on US imperialism and Okinawa to newspapers and journals (some of which reappeared in Dismantling the Empire). Much of the interest in and understanding of the “Okinawa problem” throughout the United States and other English-speaking countries (especially amongst intellectuals, political researchers, and astute journalists) owes a debt to the work of Chalmers Johnson. His writing, unlike much left wing ideology, has the persuasive power of both a former Cold War warrior and an empirical researcher. Kensei Yoshida was born in what is now Itoman, Okinawa in 1941. After dropping out of the Spanish program of Osaka University of Foreign Studies, Yoshida attended Nago English School. He then worked as a reporter for the Okinawa Morning Star before going to the United States, where he majored in journalism at Missouri University. After working as a reporter for the Weekly Okinawa Times and the Okinawa Times, he returned to Missouri University and completed a master’s degree in journalism. After working for AP Tokyo and Newsweek Tokyo Branch, and later as the spokesman and director of arts and science exchange at the Canadian Embassy in Japan, he became a professor of international relations at Obirin University. In 2006, he retired and moved to Okinawa. 9. Sensō izonshō kokka Amerika to Nihon [US and Japan: Countries Addicted to War] (Koubun Press). Click here to open the original text in a PDF file. キー:胎盤におけるセシウム137濃度: グループ 1 – 1-99 Bq/kg; グループ 2 – 100-199 Bq/kg; グループ 3– >200 Bq/kg. (Marey A.N. 共著 1974年、ルシャーエフA.P.共著 1974年、テルノフV.I., グルスカヤN.V. 1974年). Governments come and go in Japan, Noda Yoshihiko’s the most recent, being the third since the general elections of 30 August 2009 brought the Democratic Party of Japan (DPJ) to power, following those of Hatoyama Yukio and Kan Naoto. 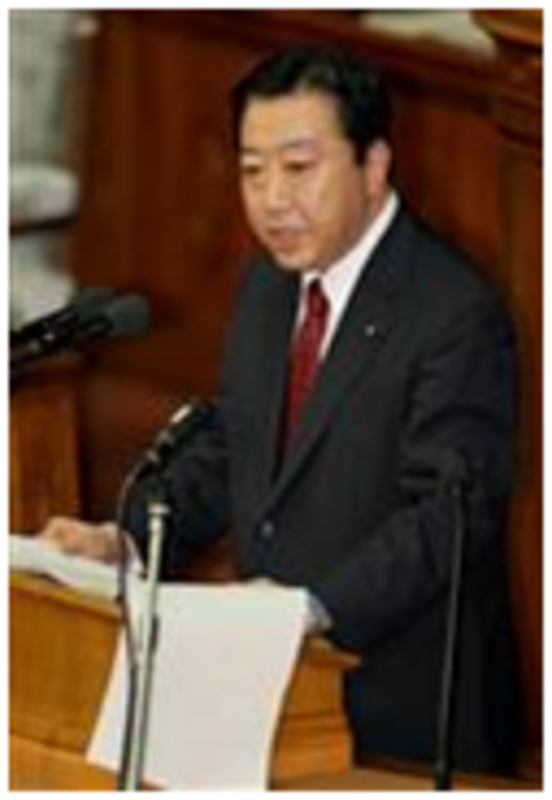 In the weeks following his assumption of office, Noda has stated his core vision for the office on many occasions, including his inaugural Diet speech as Prime Minister on 13 September. He promises to confirm, deepen, and strengthen the alliance with the US, “the axis of Japan foreign policy and security.”That means, above all else, he will construct the base for the Marine Corps in northern Okinawa designed to substitute for the Futenma base that squats dangerously in the middle of the township of Ginowan. The fact is, however, that for the past 15 years a series of Prime Ministers – seven of the LDP and three of the DPJ1 – have tried without success to accomplish this. 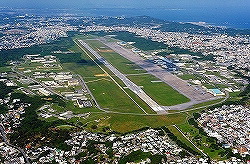 Inter-governmental agreements on the “Futenma Replacement Facility” have been made, postponed, revised, and postponed again (1996, 2006, 2009, 2010, and 2011), mostly because of the constant opposition in Okinawa, and Noda is no more likely than his predecessors to resolve the issue. The Okinawan opposition has grown steadily more determined over those fifteen years, especially the last two, since the DPJ took power promising to transfer Futenma base outside of Okinawa and then reneged on its promise. So Noda takes office pledging to do the impossible, and therefore is almost guaranteed to join the conga line of Prime Ministers jigging offstage after the others in the near future. Campbell quoted no direct words from the president, and he is well known as a core member of the Washington “Japan handlers” who have long insisted on and demanded that Japan proceed with the base construction, so it was not surprising that he would choose to emphasize this point. In the first reports of the talks published in Japan (in Yomiuri shimbun), these words, which Campbell had given no indication were the President’s, were placed within quote marks as the direct speech of the President.6 The Japanese media immediately highlighted the words “need to see results,” making it sound as though Obama had issued something close to an ultimatum. Oddly, however, the Japanese Government’s report on the meeting gave neither direct nor indirect reference to any view the President might have expressed on this matter,11 and when Noda himself was questioned about it at a press conference in New York, he shook his head at the suggestion that Obama had pressed him for action on the Futenma replacement or said “the time has come for action.” As Noda put it, he himself had explained that “determined to reduce the base burden on Okinawa, he would sincerely explain the situation and seek Okinawa’s cooperation,” to which Obama responded that he would “look forward to developments.”12 He could hardly have said anything else. Noda, in other words, simply assured the President, as he had assured the Diet and the people of Japan, that he intended to push ahead with the base construction. If the President had really made a statement about “approaching a period where we need to see results,” it would be remarkable for the Foreign Ministry’s report to include no mention of it. Asked by an opposition member at the Lower House budget committee meeting on 26 September about Obama’s reported use of the words “need to see results,” Noda replied, “I take this to be the private view of the individual who conducted the briefing [ie., Campbell], not to be coming from the President.”13. It is also clear that Japan’s national bureaucracy and mainstream national media support the position to move ahead with the base construction plan in Okinawa. They have long done so. On the eve of the New York meeting, the Asahi declared that Noda needed to “start by trying to win the trust of people in Okinawa.” 14 The Yomiuri summed up after the talks, saying, “the government must accelerate its negotiations with the Okinawa prefectural government to advance the relocation plan.”15 As both papers well knew, however, the people of Okinawa have insisted in every democratic forum possible that they would not accept any new base. The only way to “win the trust” of Okinawans, therefore, would be to tell them that it was revoking all agreements on new base construction and that it was asking Washington to quickly and unconditionally close and remove its Futenma base. But such a view was scarcely to be heard in Tokyo or Washington. The unidentified “sources” that insisted Obama had been irritated and had demanded early steps to resolve the stalemate must be presumed to be the very same Japanese officials who during the time of Prime Minister Hatoyama (2009-2010) did all they could to sabotage their Prime Minister and promote the Henoko project, while urging Washington not to show any weakness in negotiating with him.16 For them to have isolated the sentence from the Obama-Noda meeting in which Obama said whatever he said in response to Noda’s pledge - ignoring other matters that seem to have drawn greater attention such as the Hague Convention - and to thus turn the meeting into one for the delivery of an Obama ultimatum to Noda was therefore hardly surprising. The Noda-Obama meeting was all the more bizarre for following by two days a lecture given at George Washington University in Washington D.C., by Okinawan Governor Nakaima Hirokazu that flatly contradicted the Prime Minister.17 Nakaima declared that opposition in Okinawa to the Okinawan base project was almost total. He spoke of the unanimous declaration within the prefectural parliament (the Prefectural Assembly), and the explicit opposition of all 41 local government mayors and heads, including the mayor of the city of Nago, the designated site for the new base. 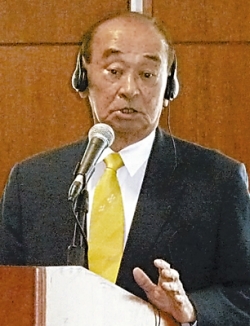 Nakaima told his Washington audience that the relocation plan “must be revised,” continuing that Futenma was “not an acceptable option” and that if the national government was to choose to proceed “against the will of the local citizens,” it might lead to “an irreparable rift … between the people of Okinawa and the US forces in the prefecture.” In other words, as this conservative Okinawa top official sees it, the national government’s specific agenda for “deepening” the alliance (that Noda would express to the President two days later) threatens to plunge it into crisis. ﻿ These two meetings – Nakaima in Washington on 19th and Noda in New York on 21st September – delivered to the US totally different and contradictory messages. Both saw in utterly different light the projected construction of a base for the Marine Corps in Nago. Nakaima’s speech exposed the emptiness of the Noda-Obama meeting and the absurdity of the continued statements by liberal and conservative mainland opinion leaders and media alike that more effort and more sincerity could somehow solve the problem. The belief that the near universal Okinawan hostility could be reversed by more “sincerity” on Noda’s part was an insult to Okinawans. In other words, Okinawa’s most senior official believed that base construction would call for rolling the tanks through Nago. The “alliance” supposedly in the name of democracy, would be called upon to justify its crushing. Nakaima’s address exposed to the Washington audience the depth of the confrontation between the nation state and the prefecture of Okinawa. For that, there is no precedent in Japan’s modern history, and it deepens year by year. What is clear from the exchanges surrounding the Noda visit is that Japan’s top bureaucrats and Washington’s “Japan handlers” are determined to press ahead with the Henoko base construction. They will brook no dissent, whether by a Japanese Prime Minister (such as Hatoyama, 2009-2010) or by Okinawa people and institutions. Fifteen years ago, Liberal Democratic Party (LDP) Prime Minister Hashimoto Ryutaro decided that the project could not be carried forward by force. No government since then has dared to suggest otherwise, with the result that government after government has sought to soften Okinawan resistance by combining carrots and sticks, but utterly failed to change it. Instead, the opposition has become more determined and more united. The US-Japan “alliance,” forever being “deepened,” thus actually grows shallower and emptier. Rarely has there been a leaders’ meeting more devoid of substance than this one between Noda and Obama, with its pious and flatulent phrases about the United States being part of the history being written in Asia, “going forward.” Tellingly, the one positive Japanese act that Obama referred to was one nearly two years old – the contribution announced in November 2009 of $5 billion over five years to Afghan reconstruction. Of course Japan pays much greater sums than that to support the Pentagon, the dollar and US policy generally, including more than double that in direct subsidy towards expenses of the US military bases in Japan (the so-called “sympathy payments”) on a per-year basis,21 but Obama’s advisers must have decided that it might be too embarrassing to refer to offer public thanks for that. The Noda government in its early weeks repeatedly declared that it would deliver on the many promises former governments had made to Washington about Okinawa. Both Noda and Genba, repeating the mantra about lessening the base burden, insisted on increasing it, requiring Okinawa to continue bearing its hugely disproportionate base burden for the sake of the alliance in the form of the construction of a new base at Henoko. Tokyo will prevail, they keep repeating, but the citizens of Okinawa have for fifteen years of mass, non-violent resistance defied all the Tokyo promises, threats and bribes designed to crush or neutralize them. No amount of “sincerity” on the part of Noda and his Ministers seemed likely to overcome that determination, and violence would threaten the very fabric of Japan’s security in whose name it would be taken. The US-Japan “Alliance” runs aground on the reef of Okinawan resistance. By making the promises he has made, supposedly in order to “deepen” the “alliance,” Noda heads towards exposing it to its greatest crisis. Gavan McCormack and Norimatsu Satoko are co-ordinators of The Asia-Pacific Journal. Gavan McCormack is an emeritus professor at Australian National University and Norimatsu Satoko is director of the Peace Philosophy Centre in Vancouver, B.C. They are currently engaged in writing a book on the Okinawa problem. Recommended citation: Gavan McCormack and Norimatsu Satoko, 'Discordant Visitors: Japanese and Okinawan Messages to the US,' The Asia-Pacific Journal Vol 9, Issue 40 No 1, October 3, 2011. 1 Takeshita, Obuchi, Mori, Koizumi, Abe, Fukuda, and Aso of the LDP, and Hatoyama and Kan of the DPJ. 2 “Obama hosts Noda, ‘advises action on base’,” Japan Times, 23 September 2011. 3 AP, Kyodo, Futenma broached at first summit, Obama hosts Noda, advises action on base,” Japan Times, 23 September 2011. 4 US Department of State, “US Foreign Policy in the Asia-Pacific Region,”21 September 2011, link. 5 US Department of State, “US Foreign Policy in the Asia-Pacific Region,”21 September 2011, link. 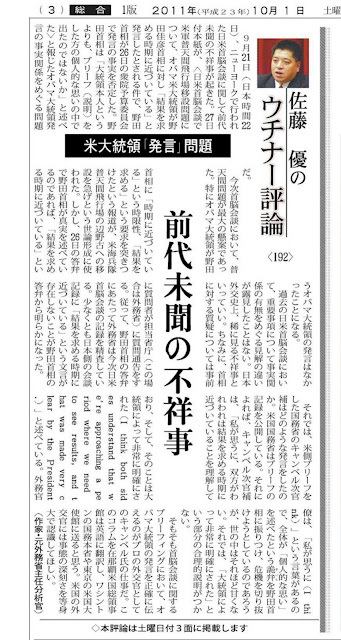 6 “Shusho ‘Futenma isetsu ni zenryoku,’ Bei daitoryo ‘shinten kitai,’” Yomiuri shimbun, 22 September 2011. 7 Takeshi Endo, “Noda-Obama hold 1st talks,“ 23 September 2011. 8 “Rough start: Obama pressed Noda at first meeting,” Asahi shimbun, 23 September 2011. 9 “Unrealistic promise on Futenma,” Japan Times, 24 September 2011. .
10 “Noda shusho Futenma shinten e kadai seou,” Jiji News Agency, 22 September 2011. For a detailed survey of Japanese media coverage, see Satoko Norimatsu, “Noda Obama kaidan hodo wa okashii,” Peace Philosophy Centre 23 September 2011, “Nichibei kaidan, Obama hatsugen to sareta mono o Noda ga hitei,” Peace Philosophy, 24 September 2011, and “Noda Obama kaidan hodo wa okashii sonogo,” 27 September 2011. 11 Ministry of Foreign Affairs, “Nichibei shuno kaidan (gaiyo),”22 September 2011, link. 12 “Futenma isetsu gigi ga fujo, kubi o kashifgeru shusho,”Ryukyu shimpo, 24 September 2011. 13 “Shuin yosan i de noda shsho bei daitoryo no kekka motomeru hatsugen hitei,” Ryukyu shimpo, 26 September 2011. 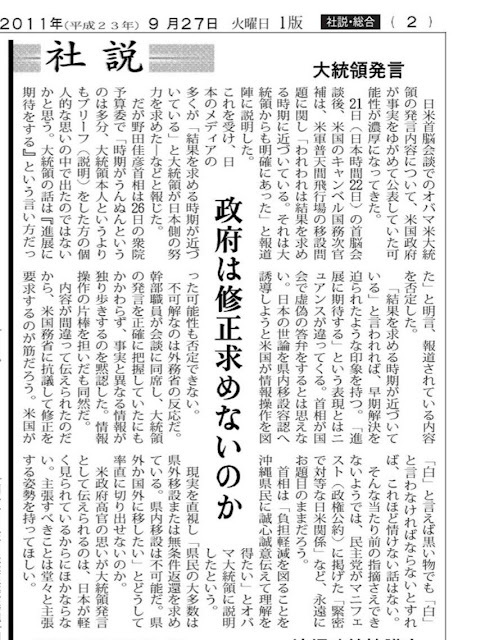 14 Editorial: Noda should win Okinawa’s trust to solve Futenma,”Asahi shimbun, 19 September 2011. 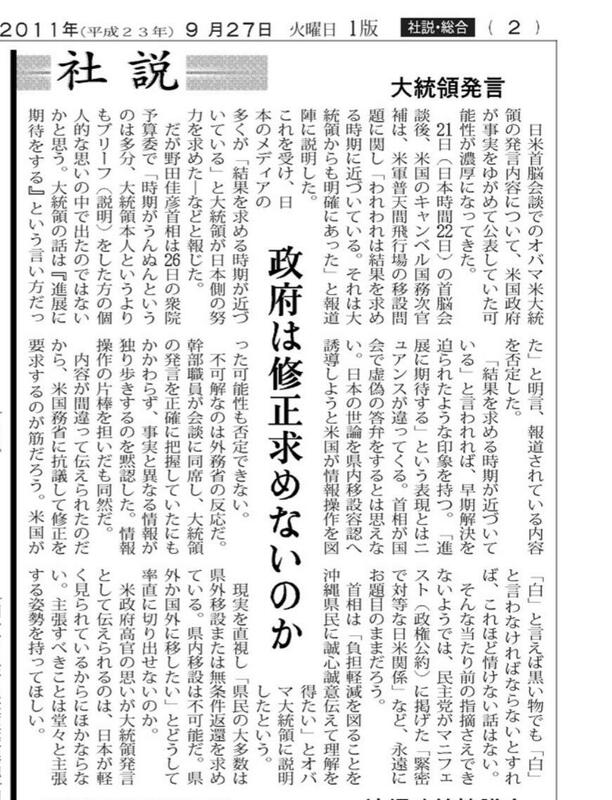 15 “To strengthen US alliance, Noda must produce results,”Yomiuri shimbun, 24 September 2011. 16 See Gavan McCormack, “Deception and Diplomacy: The US, Japan, and Okinawa,”The Asia-Pacific Journal, 23 May 2011. 17 The Nakaima speech seems to have been printed in full only in the Okinawan media, and covered only briefly elsewhere. See full text in English in Satoko Norimatsu, ”Okinawa Governor Nakaima: An Irreparable Rift in Okinawa/Japan/US Relations would result from forceful construction of Henoko base.” Peace Philosophy Centre, 22 September 2011. 18 “Unrealistic promise on Futenma,” Japan Times, 24 September 2011. 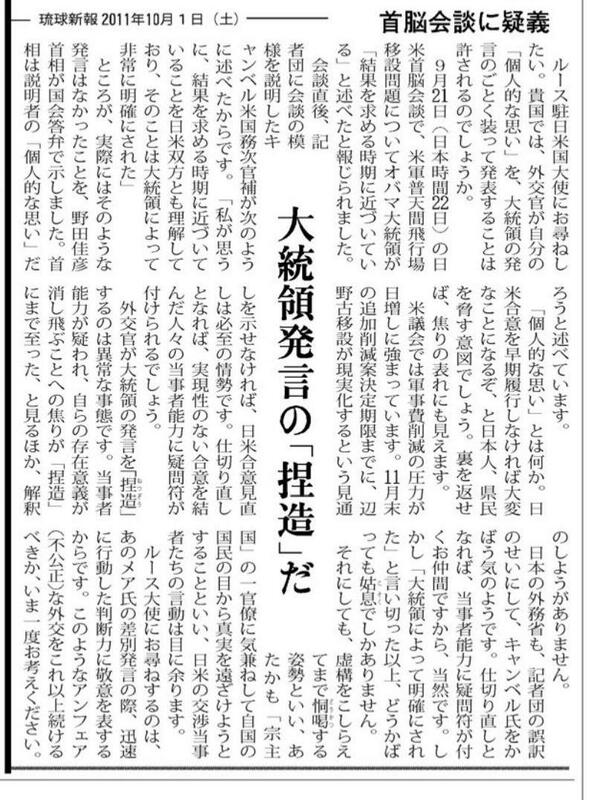 19 “Okinawa Governor denies a Japan-U.S. deal on US military realignment package,” Ryukyu shimpo, 26 September 2011 (in English). 20 On the statement by Senators Levin, MacCain and Webb, see Gavan McCormack, “Deception and Diplomacy,”op.cit. 21 The Government of Japan agreed early in 2010 to continue these payments at the 2009 rate of Y188 billion per year for five years. At today’s exchange that means approximately $2.4 billion per year, $12 billion over the five years. 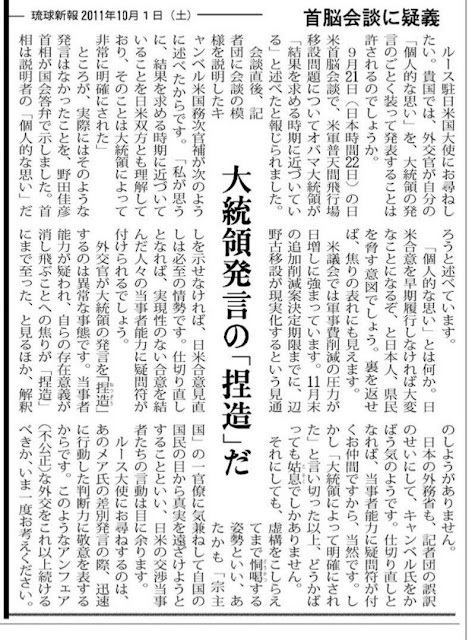 23 “Nichibei shuno kaidan, min-i hitei shite minshushugi ka,”editorial, Ryukyu shimpo, 23 September 2011. 24 See, for example, “Genba gaisho hatsugen, fumitsukete iru no wa dare ka,” Ryukyu shimpo, 7 September 2011.